Who says you have to sacrifice your health for beauty? Skin is our body’s largest organ, and protects everything inside of us. Your skincare routine is equally as important as eating well, exercising, and sleeping. Regular facials can maximize your skin’s barrier function, while also giving you a healthy glow! Just like your body has cravings for certain foods, your skin has cravings too! Allow our natural skincare experts to find out what your skin desires, then create a custom facial and homecare regimen just for you. Allow our knowledgeable estheticians to design a facial based on your skins needs, which are ever changing due to factors like weather and lifestyle choices. You relax while the experts take care of the rest to help you get the best results possible. We believe in using products that are not only good for you, but good for the environment. At SLOCO, we have partnered with Naturopathica to bring our guests results that they can feel good about. Naturopathica Facials at SLOCO can be tailored to your needs, whether you prefer for us to use only Eco-Cert Certified products, gluten free or vegan… we can do it all! Our goal is helping your skin to naturally glow, and a key part of making that happen is home care. Our estheticians strive to help you make your skin look its greatest by creating an effective regimen to use at home between facials. All of our facials use Naturopathica products and include a brief complimentary consultation to ensure you receive the best treatment possible, based on your preferences and goals, along with aftercare recommendations to help you maintain the results of your facial. This customizable Naturopathica facial is designed to address inflammation, the primary cause of premature aging. The session begins with an exfoliating treatment to sweep away dead surface cells and impurities, followed by customized moisturizing complex, proven to improve the appearance of fine lines and wrinkles, radiance, smoothness and firmness. This facial embodies our core belief that radiant skin is a reflection of health on the inside. Start by identifying your unique Skin Personality through a conversation about diet, stress level, lifestyle and skin care. 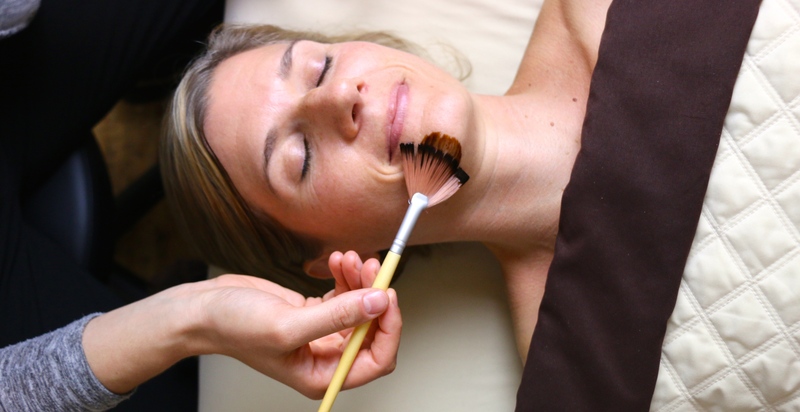 Your facial will begin with luxurious lymphatic brushing followed by a detailed sculpting massage with our probiotic Manuka Honey Cleansing Balm to release facial tension, improve blood flow and nourish your skin’s microbiome. After analyzing your skin, our highly skilled esthetician will customize your facial with a series of targeted treatments, including exfoliation and extractions. Leave with a holistic prescription of skin care, beauty foods, herbal remedies and well-being rituals that will boost and sustain your results in between treatments. Designed to help skin recover from hormonal imbalances by using the healing power of aloe, chamomile and geranium. Customized with an herbal enzyme peel for teens or those with mature skin in need of rebalancing. Nature’s cure for thirsty, moisture-deprived skin. This hydrating facial immediately replenishes the skin with deeply hydrating botanical blends. Our sensorial Soothing Hibiscus Enzyme Peel smooths and calms stressed skin. A nourishing facial massage utilizing our Gotu Kola Healing Balm leaves skin radiant and protected from harsh environmental elements. This regenerating treatment uses a Plant Stem Cell Booster Serum to slow cellular aging and plump and firm the skin. This natural face lift treatment includes an ultra-hydrating hyaluronic cream to help reduce fine lines and wrinkles. For maximum results, this facial incorporates ultrasonic and microcurrent technology that increases product penetration and stimulates collagen renewal. You can personalize your facial with any of these treatment enhancements for just $15 each. Kill bacteria and prevent future breakouts with high frequency ozone therapy. Reduce the appearance of fine lines & wrinkles, fade dark circles & stimulate cell renewal for that healthy glow. Address skin imbalances such as fine lines, blemishes, hyperpigmentation and wrinkles the natural way. This intensely hydrating sheet mask made of a kombucha culture to help create a healthy microbiome to fight inflammation and protect against environmental pollution. Rest those tired eyes under organic herbal eye pillows and enjoy a scalp massage featuring a blend of nourishing and uplifting oils to renew the spirit and soothe stress. Those stubborn blackheads don’t stand a chance. Get some extra time to extract debris from your pores, resulting in less blackheads and breakouts. Includes use of utrasonic technology to help loosen debris for easy extraction.